If you’re looking for a fun project to keep your children entertained in the holidays making a photo slide show will get them using the computer constructively, rather than just playing games or surfing the internet. The easiest way to do this is to start with a digital camera so the images are loaded directly onto the computer but you can use traditional photos and scan them into your computer. To make this project completely your child’s creation, encourage them to take the photos. You can either give them a theme or just let them run rampage with the camera and then weed out the really terrible photos afterwards. This is where a digital camera (even a good quality phone camera) really helps as you don’t have to pay to print the terrible ones in order to get the good ones. They’ll need at least ten images for a thirty second slide show – although the more images they have to choose from the better the end result will be. This is a great way to introduce your child to a new piece of software. Show them how to manipulate the images with simple tools like rotating, cropping, moving from colour to black and white, and changing block colours. Most digital cameras come with free photo editing software that will have all these tools. Before they start save copies of all their photos in a separate folder so you keep the un-edited originals. It’s good to let them experiment with new tools and see what they can do – but the results (with adults as well as children) are usually terrible! By keeping master copies of the images they can practise cropping and colouring safely without losing all their hard work. There are many different ways to create slide shows. Some camera software will come with its own facility to create slide shows or photo albums. If your software does not have this facility Microsoft Powerpoint is a simple solution. When your child has chosen their images they need to import them into the slide show. Most software these days is simple to use and has ‘wizard’ style functionality. With supervision and a little bit of help most computer savvy school aged children will be able to work their way through what they need to do. Once all the images are imported they will be able to add effects such as borders, drop shadows and glows. They will also be able to add titles and animate how the image appears on screen. Photos can fade in and out or ‘fly’ in and out from the sides or top and bottom. As well as visual effects they can add a favourite song as a soundtrack to complete their project. To watch your child’s slide show in comfort you could either plug the computer into the TV – if they are compatible. 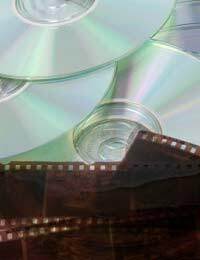 Or save the slide show onto disc and play it through your DVD player. You can also email or send the file on disc to relatives and friends as gifts!